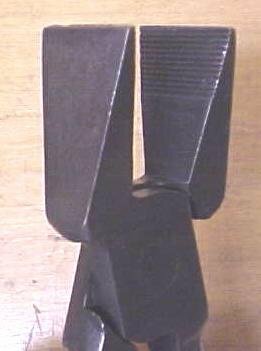 This is a unique style, wide mouth tinner's pliers with the 1" wide mouth, and the mouth jaw are flat 1.2" back from the end inside jaw measurement. They are 7" long overall. The inside handles are marked in raise cast lettering, "KNIPEX MADE IN GERMANY". This is a very nicely made cast steel pliers in very good condition with no rust, very little wear or sign of use, good straight jaws, and snug pivot pin! Nice quality! Items Similar To "Knipex Pliers Tin Seam Roofing Wide Mouth"